Hi all! I recently purchased my first new vehicle. It is a 2019 Honda CR-V Touring. I really do like it! I saw somewhere a person mention that the could view the average MPG for the current trip. They implied that it would reset and read just their current trip. All I can seem to find is Trip A, which must be manually reset. Anyone familiar with this? It would be awesome to have this. I saw another car manufacturer that had a MPG display that would reset when you got fuel, which I also liked. you can access this feature by selecting the Home icon on your display, then navigate to Info>trip computer> then select the current drive tab. this tab will reset each time the car is turned on. Last edited by tpm316; 04-08-2019 at 08:55 PM. 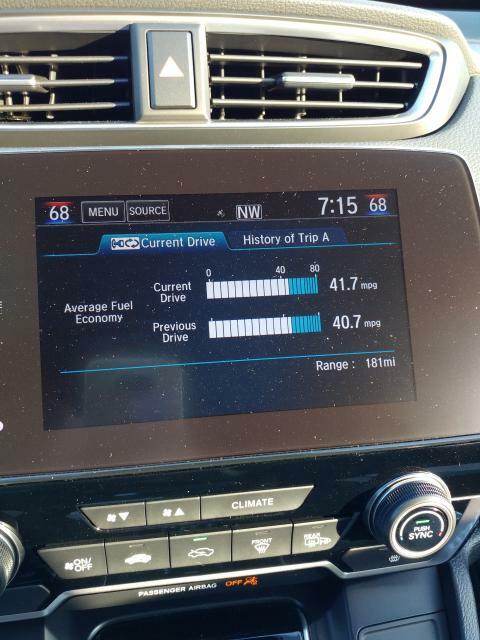 What does the gauge above the Trip Odometer and below the Average Fuel show? average mpg 22.00 down to 21.9?